Baths can be relaxing or energizing depending on the time of day, the temperature of the water, and the essential oils you use. These bath bombs will take an average bath to the next level and make it luxurious! You can choose what essential oils to add depending on your bathing preferences. Lavender, ylang ylang, and Roman chamomile are great options for a relaxing bath. Citrus oils, peppermint, eucalyptus, and rosemary can help make a bath rejuvenating. You can even try mixing up the relaxing oils and rejuvenating oils if desired. Add the wet ingredients to the dry ingredients, and mix well with a whisk. The mixture will bubble just a bit and begin to clump together. After mixing a little with the whisk, put the whisk aside and work the mixture with your fingers. Mix and blend until it is well combined and has the texture of mildly wet sand. It should clump together when you squeeze it with your fingers. If it is too dry, moisten it with the water in the spray bottle, one spritz at a time. You do not want the mixture too wet or it will not set up properly. Press the mixture firmly into bath bomb molds. Let sit for 1–2 hours. After the bath bombs are dry enough that they stick together, remove from the molds and let sit on a fluffy towel overnight before using. If you live in a humid area, you may need to dry the bath bombs for 2 nights before they’ll be set enough to gift or use. Store dry bath bombs in an airtight container or bag. If you have any leftover mixture, but not enough to make a full bath bomb, you can simply shape it into a ball with your hands and let it dry. It won’t look nearly as great as when using the the bath bomb molds, but it is still usable in a bath. NOTE: If you packed the plastic bath bomb molds really tight or leave the mixture in them too long to dry, it can be a little difficult to get the bath bombs out. However, it is possible if you use pliers to pull the sides apart. You can even use pens or something long and straight to stick in the holes on the tabs and use them as leverage to pull the mold apart. If the bombs are fully dry and you can only get one side off, you can place your fingers under the lip and press your thumbs in the center to pop the bath bomb out or gently push down the exposed bath bomb with the side of the thumb. Try using food coloring (added to the wet ingredients) and dry herbs (added to the molds before pressing in the bath bomb mixture) to decorate the bath bombs. 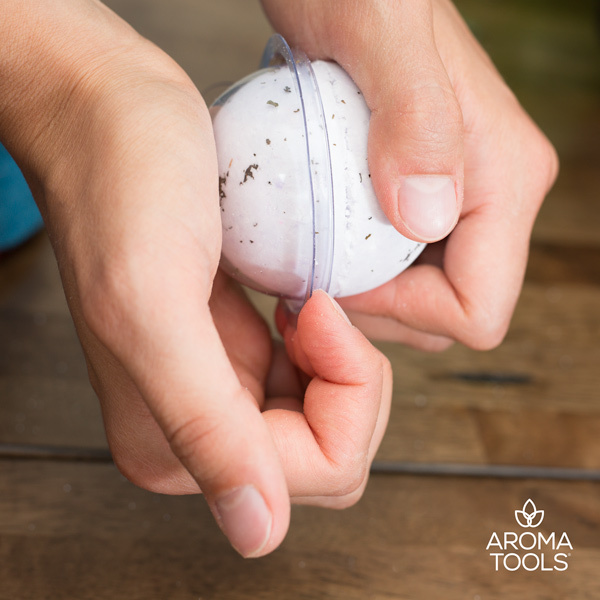 If you want to make different scented bath bombs, you can try making the bath bombs unscented, then add about 5 drops of essential oil to the middle of the bath bomb before pressing the mold together. Try different essential oils for different purposes. For example, try making some relaxing bath bombs with soothing essential oils (e.g., lavender, ylang ylang, or Roman chamomile) or energizing bath bombs with invigorating essential oils (e.g., citrus oils, peppermint, eucalyptus, or rosemary). 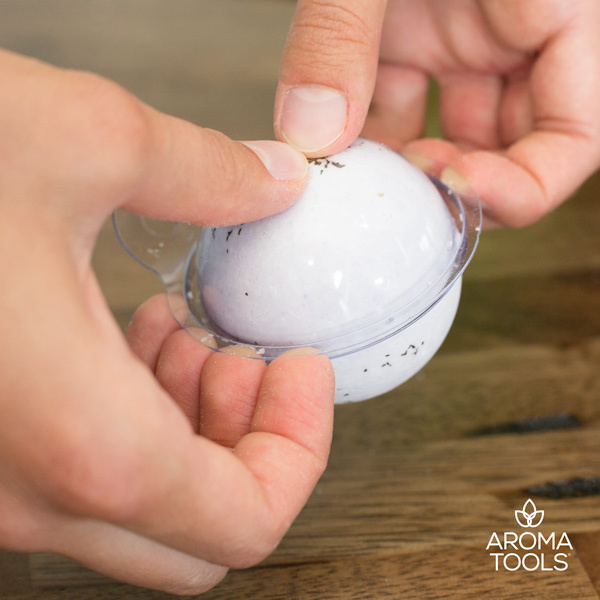 These bath bombs make a great activity for a make-and-take essential oil class. Give everyone a Plastic Bath Bomb Mold, and double the recipe to make 10 bath bombs. Let your attendees press the mixture into their molds and add their desired essential oil to the bath bomb before pressing both sides together. If you live in a area with hard water, you probably have hard water deposits on everything, including bathtubs, showers and sinks. These deposits make faucets and fixtures an eyesore. We found a solution that works pretty well! Epsom Salt Scrub uses salt crystals that are just abrasive enough to remove the hard water deposits. Added baking soda, castile soap, and lemon essential oil do the rest of the cleaning. Add all ingredients to the jar in order and stir together until well incorporated. To use, apply to dry shower walls, bathtubs, fixtures, or faucets with a warm wet cloth. Scrub for a few minutes in a circular motion. Let sit for a few minutes before rubbing again. Rinse off with warm water. Repeat if needed. This sudsy body wash smells great and leaves men’s skin feeling healthy and moisturized! This makes a great DIY Father’s Day gift! Shake up the bottle to ensure ingredients are mixed thoroughly before each use. Use in the shower with a wash cloth or loofah. We liked this essential oil blend, but have fun experimenting with other ones as well! This fun art project is not only helpful for keeping kids entertained, but it also helps build fine motor skills as kids learn how to draw up the colored water using a pipette and release the liquid onto their salt image. Get creative, and have fun while enjoying the wonderful scents of essential oils!